While we're doing our best to help you offer the finest possible service to your customers, we also trying to provide you with great tools to analyze and measure your success. 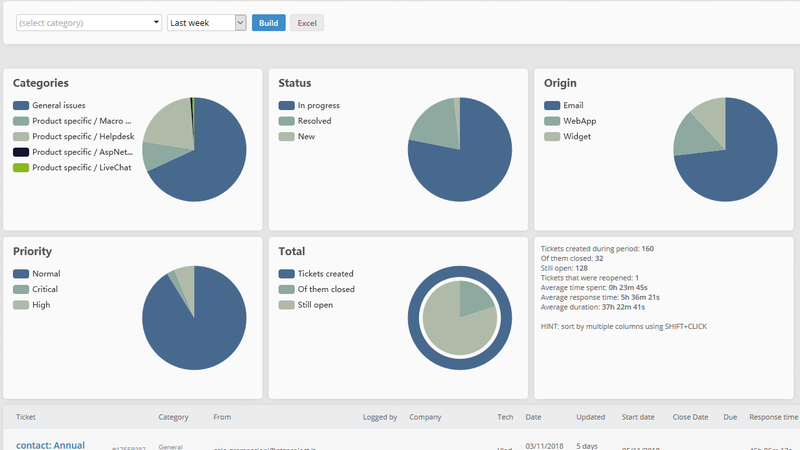 Jitbit Helpdesk has plenty of useful reports built-in. Let's take a quick look at all of them. The summary report lets you see all tickets, filtered by categories, status, given time period, tags, closing date etc. The tickets will be presented as a convenient table where you will see the response times, the durations and the time spent (along with the standard columns like the ticket assignees and the creation dates) for each ticket. Along with a summary chart on top, giving you a quick overview. The best thing is that you can export the whole table to Excel to perform a more complex analysis. The "Tickets per day" report shows you how many tickets were created and closed in a given week, day or month. It makes it a very convenient tool to monitor you current performance. 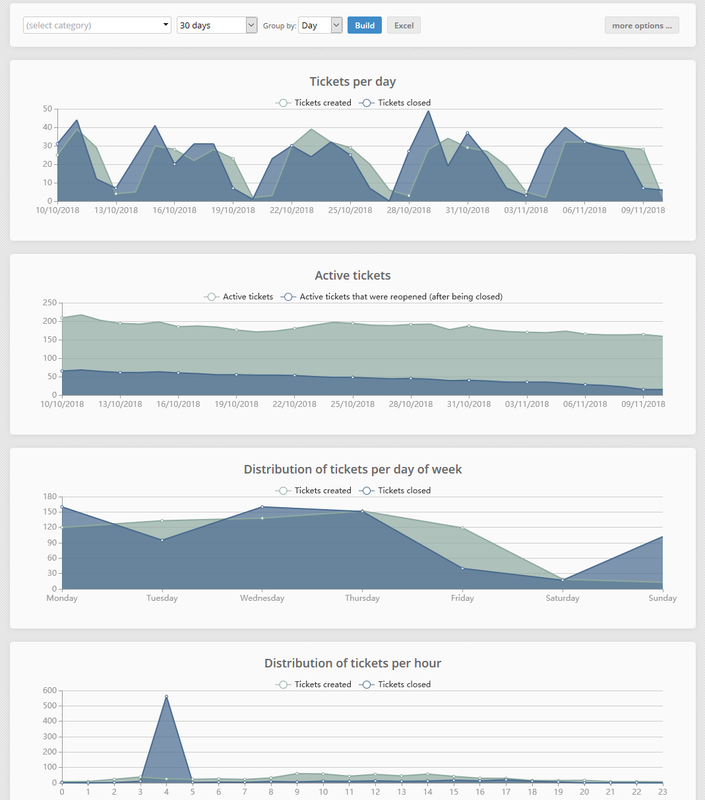 Also this report shows tickets distribution per day of week and per time of day during the specified time period. You can use this information to predict the times when you will have the highest load. You will instantly see that, for example, most of the tickets get created in your helpdesk, say, on Wednesdays at 3PM. Which one of your technicians performs better? This report gives you the answer. If you want to choose a "support agent of the month", this is the way to go. These two reports show how many tickets each user and company have created. It also shows you how many active tickets they still have unclosed. You can quickly see which of your clients creates most tickets. We believe that response speed and overall ticket duration are critical for a great customer service experience. We've built this report to measure your efforts in this field. 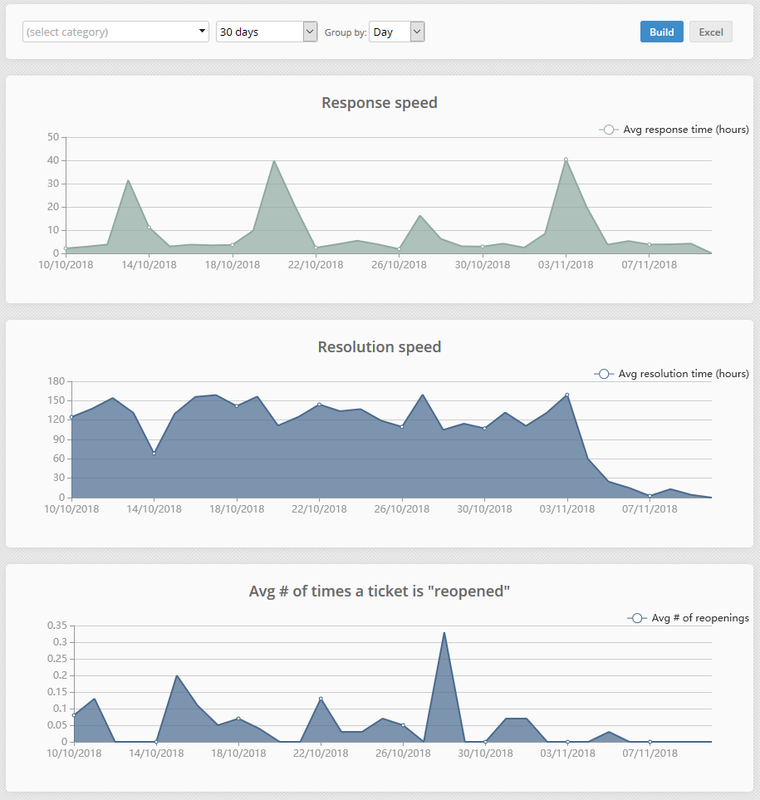 It shows two line charts, the first one shows the average first response speed on a given time period, the second one shows the average overall duration of a ticket. The response speed is calculated by subtracting the first comment date from the creation date of a ticket. We subtract the finish date from the creation date to calculate the resolution speed for a ticket. Both charts show time in hours. 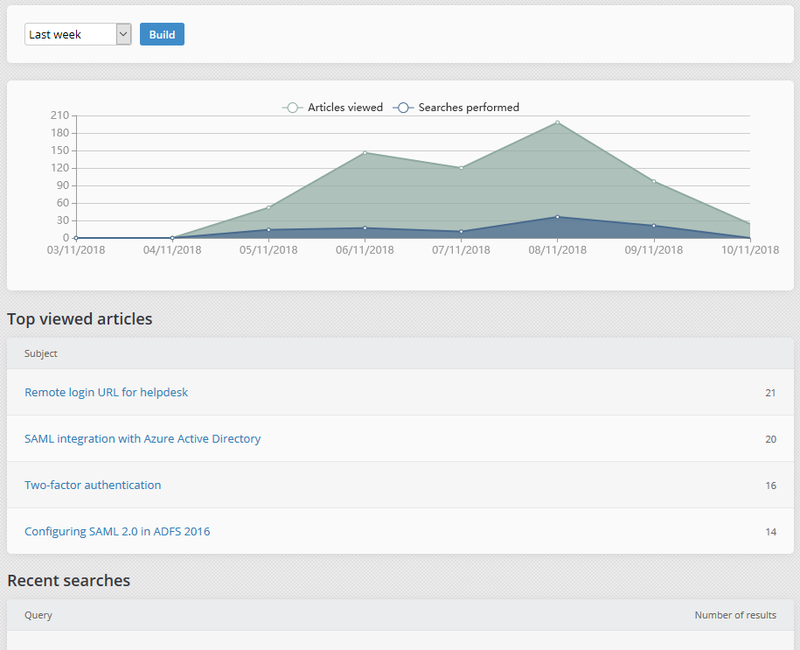 See your most viewed Knowledge base articles, 20 recent KB searches and whether these searches have returned any results. Which category has tickets with the most duration. Which tech has the fastest response speed. Tickets from what company you spend the most time on. These items barely scratch the surface of what you can get from our reports module and you can be sure we're always thinking of additions that will help you perform better.